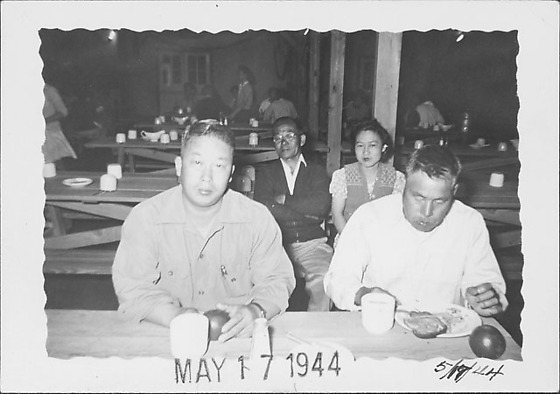 Two men sit and eat at a wooden table in foreground in a mess hall at Rohwer concentration camp, Rohwer, Arkansas, May 17, 1944. Man on left holds an apple and looks directly at the viewer, while the man at right eats from a plate full of food. Behind them, an elderly man sits with his arms crossed next to a younger woman in a sweater vest and short-sleeved blouse. People are visible at tables in the background. Wavy edged border. Stamped in black ink on front border, B and on back, C: MAY 17 1944. Written in red ink at BR: 5/17/44.